Do Hogwarts Students go to Kindergarten? Hogwarts is probably the coolest school to ever exist in any universe. (Except maybe Xavier’s School for Gifted Youngsters….) Their classes are all very exciting and seem to be very hands on. On their very first day of Transfiguration, they were already trying to transfigure a match into a needle (You’ll remember that Hermione Granger was the only person who was able to do it). They learn how to brew potions almost at once and they seemed essentially bored to death while taking Professor Binn’s History of Magic course. How come the students at Hogwarts don’t take a foreign language class, or an English course where they could read literature written by famous wizards and witches? Where are the creative arts classes? We know that Hermione and Harry (along with other muggle raised students) attended grade school before getting their Hogwarts letters. But what do wizarding families like the Weasleys and Malfoys do? The wizarding world is very similar to the medieval times, when families would teach their children the basics to reading and writing. I’m sure the Malfoys hired Draco a private tutor, but what did the Weasley’s do. Did Molly essentially home school all seven of her kids before sending them to Hogwarts? As you enter higher grades, you’re allowed to take elective courses that range from Divination to Muggle Studies. These courses may seem interesting, but what exactly are the students learning from them? At least in both Potions an Transfiguration, students focus on both theory and then implement what they’ve learned. After reading the series, it seems classes like Care of Magical Creatures and History of Magic are a complete joke. And when are the students getting physical education? They take a required flying class their first year, but its never mentioned again throughout the series. I’m guessing after you’re first year, you’re either on the quidditch team, or you don’t need the flying lessons anymore. It also puzzles me why they don’t take classes on the current status of the muggle or wizarding world. Maybe that’s what Muggle Studies is, but since Harry never took the class, as readers, we really have no idea what the class covers. Since classes are approved by the Ministry of Magic, and the teachers are given free reign over the subjects, why doesn’t the ministry approve a 6th or 7th year course on the inner workings of the government. This could be a great program to get students interested in working for the Ministry after graduation. The curriculum is very practical based, and as I’ve stated before, strays away from the creative arts. I imagine that most of the curriculum has been the same since Dumbledore himself attended Hogwarts. So once again, I wonder exactly how the students learn the basics of reading and writing, or even the history o the culture. We all took history classes when we were younger; they weren’t in-depth my any means, but it laid out the groundwork for theoretical classes in high school and college. But Hogwarts doesn’t allow for this. There are no “universities” or “colleges” students can attend if they wish to continue studying after graduation. 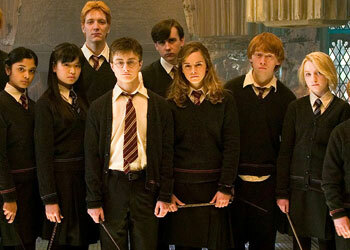 What do you think of the education system in the wizarding world? Is Hogwarts the only school that chooses to have a more traditional based curriculum? Do Beauxbatons or Durmstrang have something entirely different? How do you think future Hogwarts students learn the basics of reading and writing? And if you had a child who would be attending Hogwarts when they turned eleven, how would you choose to educate them? I myself have wondered these same thoughts quite a few times and everytime I come to the same conclusion, whichc is that basically wizard children definitely lack a lot of the skills that Muggle borns learn by attending regular school before entering Hogwarts. I'm sorry but duh Hermione is the smartest girl in school, its because she spent her formative years learning things like How to write and ESSAY and understanding things beyond the tiny bubble that Hogwarts creates for its students. I suppose as long as you know how to do magic it makes knowing things like physics, chemistry, and math all superfluous because you could just wave your wand and make all of the knowledge of how things work unneccessary because the whole point of magic is that it exists outside of the boundaries of the natural universe. But still Muggle borns seem to have the advantage/best of both worlds as far as education goes, however their complete lack of knowledge about anything invovling the wizarding world leaves them looking like that awkward smart kid with no common sense who no one really wants to hang out with because they are annoying (cough cough Hermione).